No other city in the world is as famous as New York. Its dramatic skyline and iconic landmarks have served as a cinematic backdrop for great love stories throughout the last century: Carrie and Big, Harry and Sally, Holly Golightly and Paul Varjak — the list goes on! 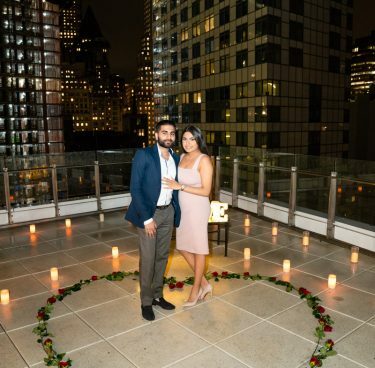 With a wide variety of places to pop the question, as well as expert vendors available throughout the city, we believe NYC is truly the best place for a marriage proposal. New York is a sprawling metropolis, filled with all sorts of vibrant streets, green parks, and instantly-recognizable landmarks. Whether you prefer your feet firmly planted on the ground in Central Park or dare to pop the question from atop the highest skyscraper, there are no shortage of unique places to propose in NYC. 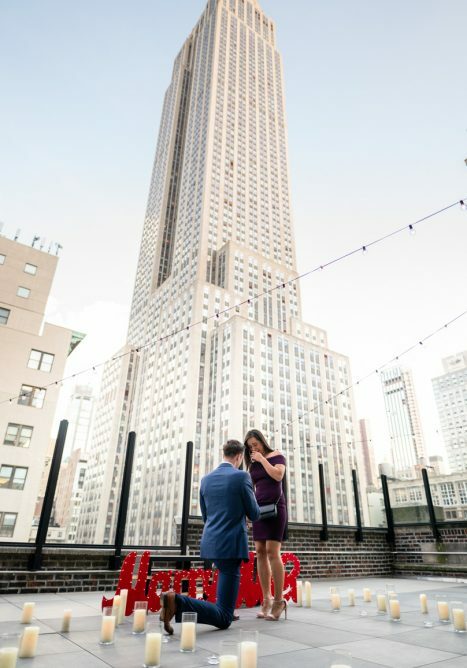 For a big, movie-style moment, we love creating surprise proposals in public places like Grand Central Station, Times Square, or Top of the Rock. You simply can’t go wrong in one of the city’s famous parks like Central Park or the more modern High Line! Or perhaps you and your beloved have visited the city before. 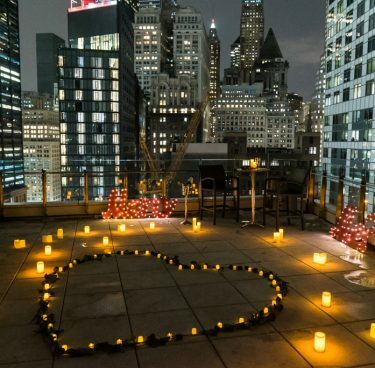 Why not choose a spot that has special meaning for just the two of you, like the little Italian place you went on your first date or the park bench where you first said, “I love you.” If you’re looking for a even more exclusivity and intimacy, consider a private rooftop overlooking the city. Our team has scouted countless locations around New York in order to hand-select the best places for our NYC proposal packages. How Much Does Proposing in New York Cost? Between securing a location, dealing with private owners and permitted spaces, customizing with flowers or champagne, and hiring a photographer to capture the moment, a memorable New York proposal can cost upwards of $2,000. Our team has negotiated discounts with a number of partners and can access special prices not advertised to the public. We’ve created custom NYC proposals and pre-arranged proposal packages that take the guesswork out of planning a dream proposal in the city. Should I Hire a Proposal Photographer in NYC? Sometimes a grainy iPhone selfie is just not enough! Proposing to your beloved, especially in a picturesque city like New York, is a moment you’ll want to properly capture so you can revisit the experience over and over again. Being able to share the happy occasion with family and friends is even more special when there are high-quality photos to show them. 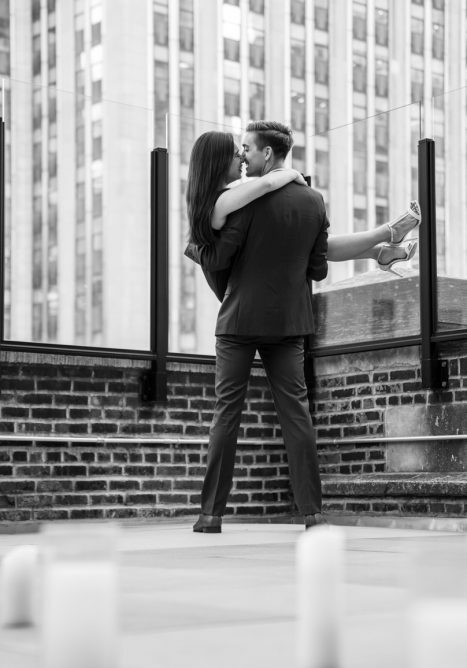 Vlad Leto is a photographer who specializes in capturing surprise proposals in New York City. With years of experience under his belt, Vlad knows exactly how to discreetly capture the build-up, the big question, and the joyous reaction! For such a one-in-a-lifetime moment, you won’t want to entrust this responsibility to anyone other than a professional. Should I Hire an NYC Proposal Planner? With so many details to consider and expectations to exceed, it’s a great idea to hire a professional NYC proposal planner to help. Rather than worrying about finding the right location or accidentally ruining the surprise, leave it all to our team and just focus on enjoying every moment of this special day. Our proposal planners have access to private venues around the city and have negotiated special discounts just for our clients, meaning you’ll be able to deliver the kind of memorable proposal story your beloved will want to tell over and over again!